Kim Kardashian defends her actions after coming under fire for giving only a small fraction of her Ebay auction to Philippines hurricane survivors after claiming the auction was for their benefit. Kim Kardashian is tired of the negativity. The 33-year-old reality starlet took to her blog to defend herself after being attacked by critics for giving just 10% of her eBay auction profits to the victims of Typhoon Haiyan. "I feel compelled to speak about something that is in my head and my heart,” she wrote. “Over the years, I've had to grow a thick skin. Being in the public eye, there are times I feel like I get criticized for any and everything I do. I'm used to it now. I just choose not to feed into negativity or become consumed by it. "For people to attack me for giving 10% of my eBay auction sales to the people of the Philippines — that hurts,” she continued about the backlash last month over the amount of money she donated to the relief efforts. "This month it's for the people of the Philippines, last month was Life Change Community Church,” she declared. Kardashain went on to explain to her fans how the profits from the popular auction site end up getting divided. "When the eBay numbers get broken down, the auction management agency that posts for me gets a percentage for all of their hard work, then eBay listing fees, end of auction fees, eBay Store fees, Paypal fees, etc., all add up to about half of the sale. Then I give 10% to a charity," she said. "Truth is how the (number) is broken down, is neither here nor there," she wrote. "The people of the Philippines need all of our help, no matter how big or small." causes," Kanye West's fiancée continued in her defense. "I will continue to do what is in my heart and am happy to know many others have enjoyed purchasing from me, as they too are giving with me." "Giving comes from the heart," she added. Aren't you guys glad that gas prices are going down!!! kim keep getting plastic surgery, pretty soon she ain't gonna have any skin or facial parts left to tinker with. she'll have to walk around with a mask to cover up what's left of her face. if it was for charity, why did you have to profit at all? why would you need a company to do the sale? we all saw the "much publicized" garage sale, why not just have another? Her new plastic surgery now makes her look solemn. She needs to just stop or she's going to wound up looking weird. Many so-called "charities" engage in this practice. 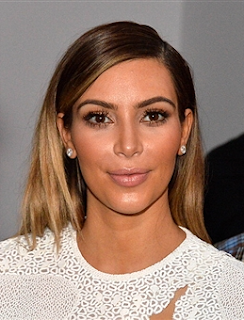 Kim keeps getting uglier and uglier, and this pic really shows her plastic surgery. She needs to quit, but she wont.